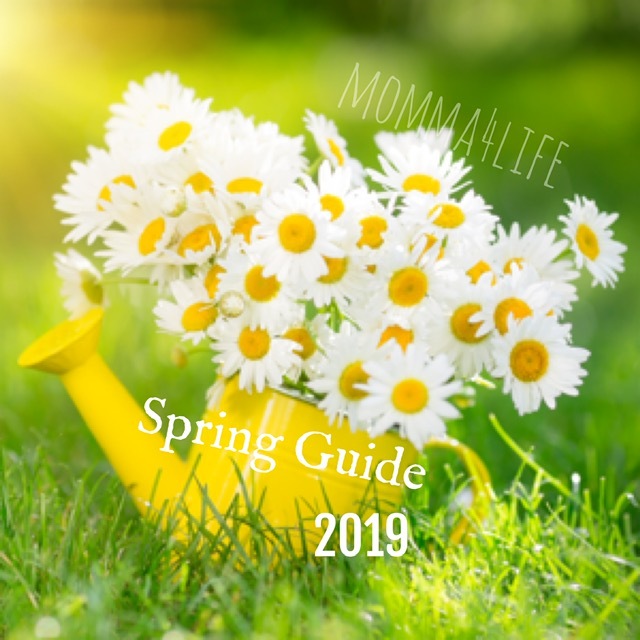 Have you ever heard of the Amish Toy Box Company?? They have a ton of handcrafted furniture, toys, doll furniture, games, puzzles, trains, trucks and so much more. Everything is handcrafted!!! The item we were able to review is the Childrens Maple Wood Toy Box this toy box is beautiful it came already put together and as soon as we opened it you can tell it was just made it had that smell of new wood does anyone know what I mean by that?? I love that smell. I know I'm silly, but it is so pretty and my daughter loves it she is such a little princess and has tons of stuff to place in this box. 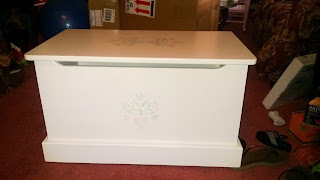 This toy box is $165.00 for a Small, $205.00 for a Medium, and $265.00 for a large. Children's Maplewood Toy Box. Now you can keep your kid's play room organized with ease. 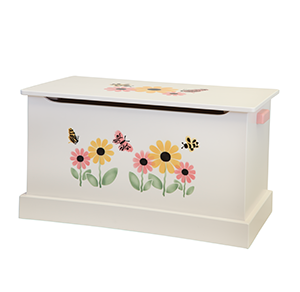 Our lovely Maplewood Toy Box will add a beautiful accent to any room and is built to last a lifetime. It is quality crafted out of solid Maple Wood by the Amish folks at Lapps Toys in Lancaster County, Pennsylvania. All our toy boxes are made with heavy duty lid supports to protect your child from getting their fingers pinched. You can choose from three different sizes to best meet your needs. 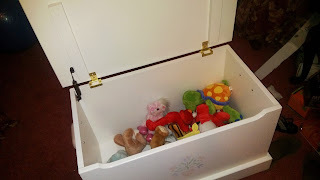 The small size toy box dimensions are 30"L x 17"W x 17.5"H, the medium toy box dimensions are 34.5"L x 18"W x 20"H, and the large size toy box dimensions are 42"L x 20.5"W x 21"H. Also, choose between 3 different finishes: Harvest Pine, White with Daisy stenciling, or Harvest Pine with Sport Balls stenciling. Please allow 1-2 extra business days for delivery since the toy box is an extra large item and will ship directly from Lapps Toys. The box we have is white with blue flowers and a heart on the bottom. 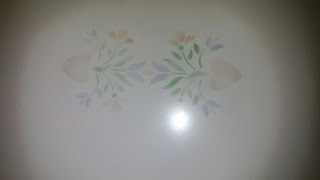 It is a beautiful design that we love and I am sure you will too. Would you like to win a $50 dollar voucher to spend at Amish Toy Box or to put toward something you like??? Then enter the Rafflecopter Below for your chance to win!! What a perfect Christmas Present for that special someone!!! The one shown in this photo is the older design but the picture below is the new version!! I think the children's hutch is adorable! I think I'd get my son the car roller or the wooden train, he'd love both! The marble machine and marble brain teaser look like they'd be a blast. I'd definitely choose the Doll Cradle, I've been looking for one just like it. the box is soooo cute! on the site, even though it's very basic and plain, I really like the children's bench. 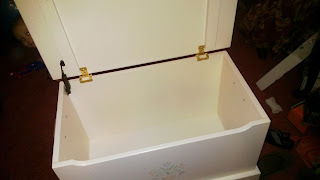 it looks sturdy and it seems like something you could find a use for even after your kids get too big for it. I would get Doll Oval Table. My daughter loves playing tea time and cooking for her dolls; this would be a nice accessory. Though there's a bunch of great stuff, I'd actually gift this to my father. He loves amish furniture. I really love the children's bench! The childrens bench would be great! 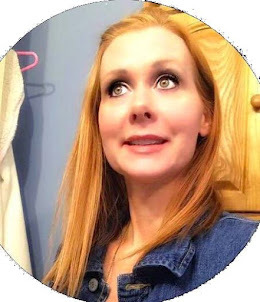 love amish furniture! Love the toy box and the train. I'd probably buy a couple Wren House's and other things!